Back cover blurb: 'Who is the most devious, dastardly, cheating chiseller in the whole of Texas? Who is the man with the most evil, wicked, two-faced leer in the whole world of TV? 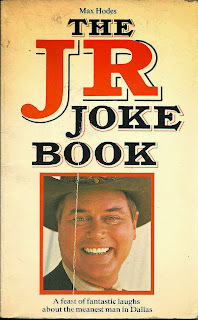 Quick flick reveals: A collection of jokes about JR Ewing from Dallas. Except some of them aren't really, and are just existing jokes with JR's name shoved into them. As joke books go, this one is possibly a bit too fictional oil magnate-specific. Dedicated to Terry Wogan. Random jokes: Why did JR join a slimming club? To try and trim his multi-national corporation. Why does JR watch the 'South Bank Show' every Sunday? So he can Bragg about it all week. Why did JR give up being a window cleaner? He realised he was in the rung profession.